London's famous black cabs. A repair garage for taxis. Interesting graffiti, especially the writing on the brick wall. Another great photo - we are all 'WATCHIN U'. My grandad was a cabbie in London & had the cab looked at in 'Bobbets Yard, Westminster. Such a great shot. 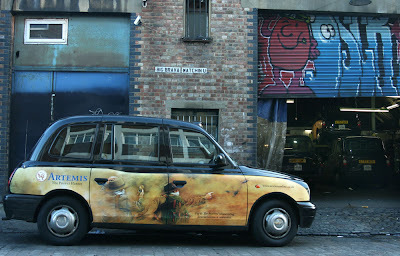 I love the London cabs, even with graffiti! Ciao. A. A very nice shot, of the iconic Black London Cab. I like this shot because the design on the cab links to the graffitied walls. I appreciate all types of art, be it a museum piece or street art, seen both on the car advert and the garage wall. A very insightful London scene. Love it! I love the pictures. Thanks for blogging! What a cosy corner of London you've found! Definitely a sweet looking older style car...a fixer upper! Gave you some ad appreciation too. Interesting photo. Lots to look at. Thank you for exposing photos that capture the essence of a wonderful world center. I will be visiting London in April and will check your blog to keep updated with weather and places to visit! Great site and great photos - a very worthy blog of note! Trying to spread something...here's a great way to earn some cool prizes while you do online searches. It's called swagbucks. It's another way of doing google searches (you'll get the same great results) but you get points/swagbucks for some of the searches you do (depending on the words you use in your search...) and then you can redeem your "bucks" for different prizes/gift cards. Click on this link below to sign up. You'll get 3 swagbucks just for signing up!! That is an interesting sign on the wall. Sort of ominous. Is that an ad for a TV show on the cab? great blog, I like it. From Argentina...keep working coz' yours pics are really goods. Great shot! Big Brava Watchin U.
hi i like your photo! I don't know if London has graffitied cabs. This is so cool; I love Graffiti work like this. Great Blog, Shows That You Are Inspired By London. I Am A Student Also Researching About London. Check My Blog When You Can. I just took a closer look at the photo by clicking on it, and man. That is some amazing artwork along the driver side doors. Well done. Cool. Love the garage door, too! I wouldn't call it pretty but it gets you from A to B I suppose. Poor wounded cab. I love those taxis. We have them here in Charleston, SC and I catch them in pictures whenever I can. Sheeesh. My mistake. In the little version I thought the cab had been hit. I had to enlarge it to see it was all part of the ad. this is a magnificent capture .. you are lucky to find such a spot.